There’s never a dull moment in Papua New Guinea and the last couple of weeks have been more eventful than usual. The saga of the leadership struggle in Parliament continues. After avoiding being arrested, the Prime Minister hit back with arrest warrants for the leader of the Opposition. There was a showdown at his house and a crowd of supporters prevented police from entering to make the arrest. 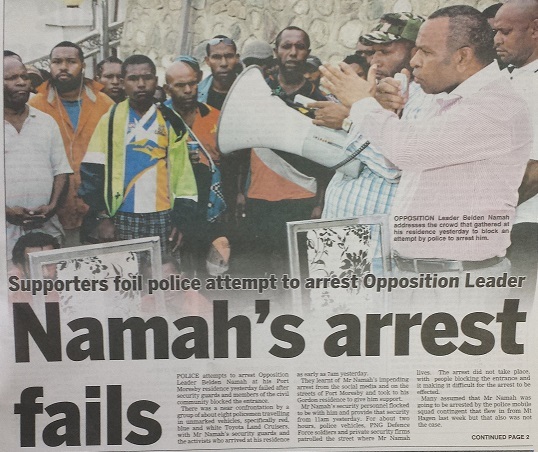 Things could have turned very ugly indeed but fortunately, the police backed down and Namah remains out of prison. An enquiry has been held to investigate those who issued the warrants for the PM and other high-level Government members. Now Namah is doing his best to keep those police out of prison too. The saga continues. 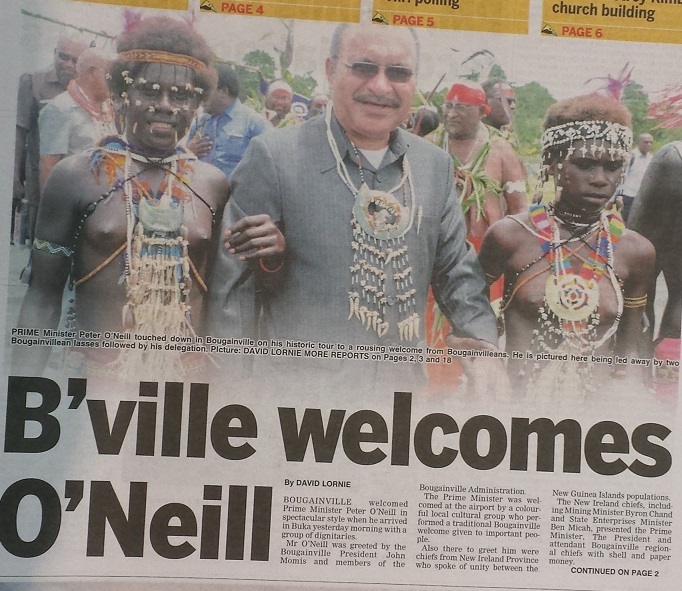 Meanwhile, the PM seemed unperturbed by all this and had plenty to smile about when he arrived in Bougainville this week, flanked by young women in traditional dress. He was there for historic meetings that included an apology for the civil war that raged in Bougainville in the 1990s. This country is never shy about providing a barrage of truly disturbing news stories, which sadly reflect the realities of life here for everyday people. I don’t mention most of the horrific stories that one hears about here because it wouldn’t leave any time to write about the positive aspects of PNG. There was an outcry recently over one such story. This country has a culture of compensation, which operates not unlike the formal Torts system. Instead of suing people in court, there is a negotiation and an aggrieved party receives a payment of some kind to compensate them for their loss. In Jiwaka Province, a teacher was killed by the people from one village and the neighbouring villagers demanded compensation. 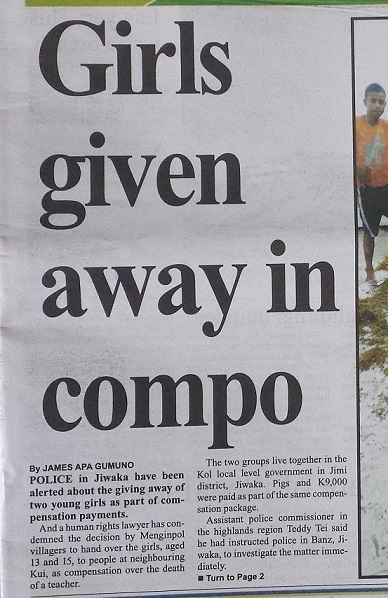 The agreed compensation package was 9,000 kina, some pigs and two teenage girls, aged 13 and 15. There was widespread outrage at the news and women’s groups were extremely vocal about what amounts to human trafficking. The police were called and I believe the situation has now been resolved and the girls returned to their homes. I have lived here for a year now and this is the first time that I have heard of such a situation. Hopefully, the widespread condemnation of the decision will dissuade others from trying to give away their daughters in future compensation battles. 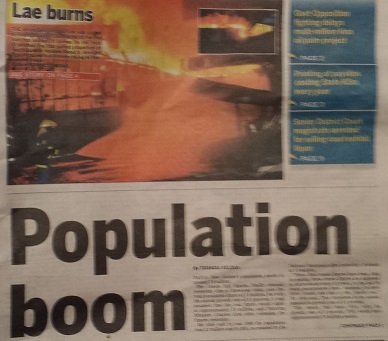 The population of PNG has jumped to 7.8 million. Nobody knew because it took a couple of years for the census statistics to be processed. But apparently Papua New Guineans need to watch more television. Oh and a popular store called “Brian Bell” burned down in Lae. I recently learned that while I was away there was a major security incident right outside my house. It involved an attempt by two men to steal a car. The driver panicked and drove it down a ravine (but not was not seriously injured). Guards came running from nearby houses. There was a shootout leaving one of the criminals dead and the other left a blood trail so he can’t have been in great shape. 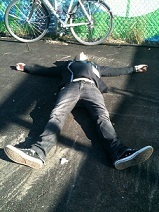 All this while I was snowboarding and enjoying the occasional latte in Vancouver. This country still surprises me on a regular basis. Cyclone Dylan passed by here on its way to Australia. 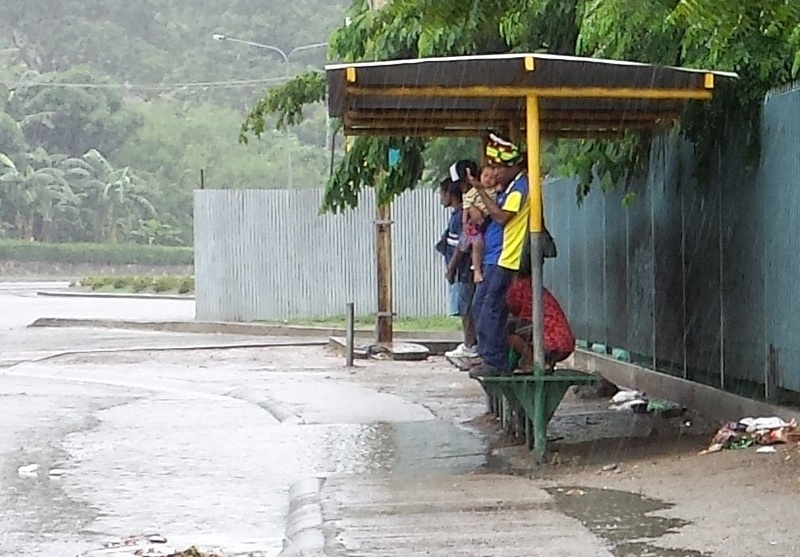 A series of ferocious storms have pounded Port Moresby over the last few days, leaving trees down and detritus all over the city’s roads. The Cyclone is presently pounding North-Eastern Queensland. 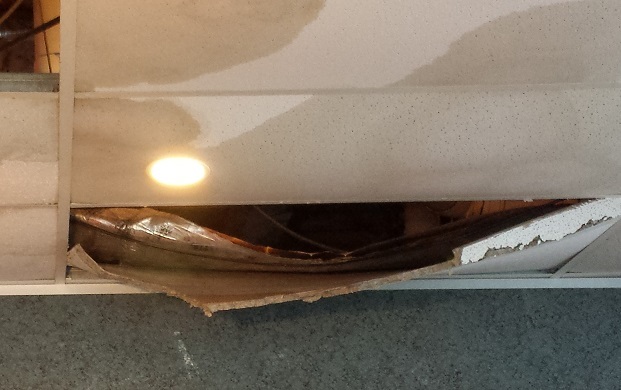 I arrived in the office yesterday to discover that leaks in the roof had caused the ceiling to collapse in places. 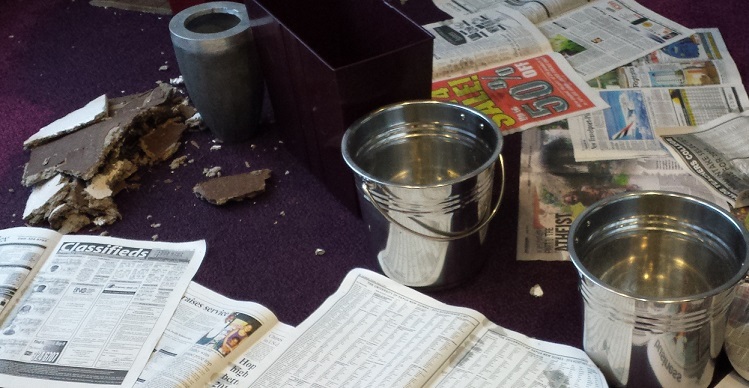 I bought some buckets and laid down paper to soak up the water that was coursing through offices and out into the hallway. Driving is perilous here at the best of time, but particularly daunting when the water flows across the road in rivulets washing debris and rubbish onto the road. 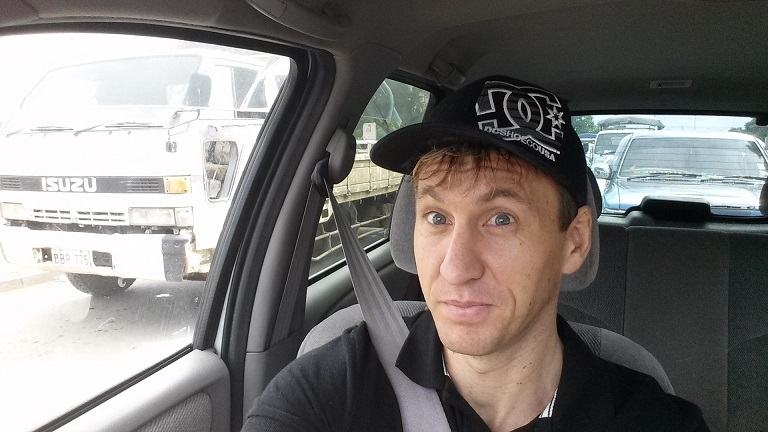 People are constantly getting around in the back of pick-up trucks (utilities) here in PNG. But it’s considerably less fun when a tropical storm hits. 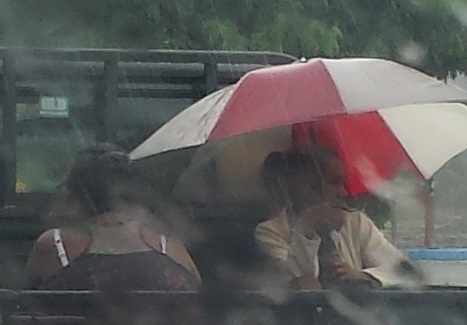 These poor folks were trying to keep out of the rain under this flooded bus shelter. When the weather finally calms down, one gets a sense of the impacts. All of those thoughtlessly discarded drink bottles and crisp packets get washed into the waterways, like this one near the Yacht Club. I’ve taken to walking around the Yacht Club a fair bit recently. It’s one of the frustrations that I hear expressed by expatriates regularly here – that they wish that they could just go for a walk outdoors like they do in other countries. It’s simply not safe to do that here. So every day, literally dozens of expatriates do the tour of the marina around the Yacht Club. It’s a pleasant walk and one of the few places where one can exercise outdoors without fearing for one’s life. 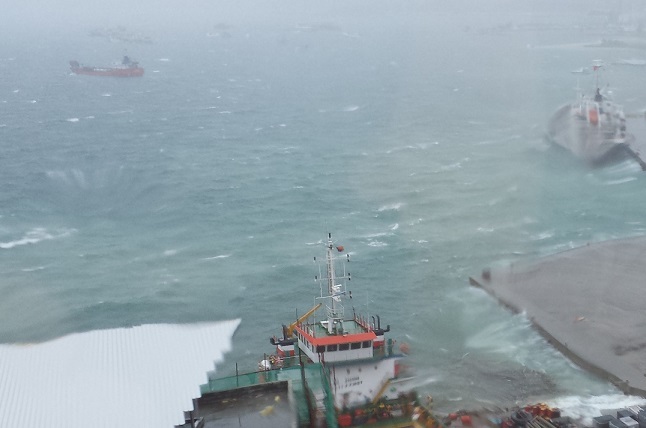 It’s interesting to watch the fishing boats and other watercraft in the harbour. And to check out the houses on stilts further around the coast. 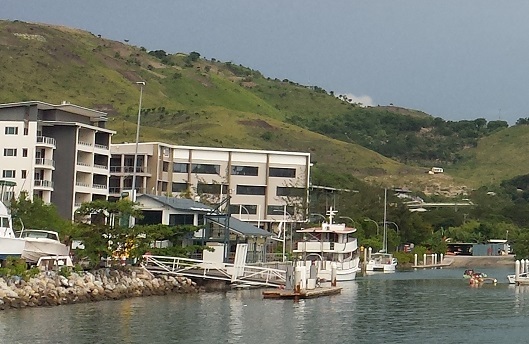 The views around the marina are interesting, as are the boats anchored inside. 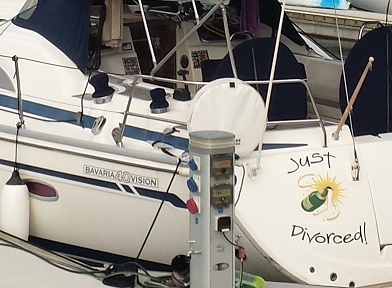 This one clearly belongs to some bitter divorcee enjoying their newfound freedom. Of course, the walk around the marina would be far more pleasant if it didn’t involve the risk of lung cancer. 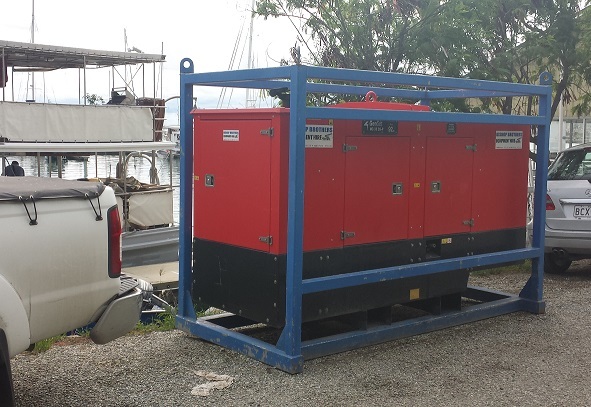 Some selfish prat decided to pollute the air of the walkers by placing a giant diesel generator right on the walking track. Now that diesel fumes have been scientifically proven to be carcinogenic (i.e. they cause cancer), that’s rather a selfish and thoughtless choice. I wonder how he’d feel if I erected a nice wall around his generator to block the fumes. Perhaps I’ll build it out of asbestos. 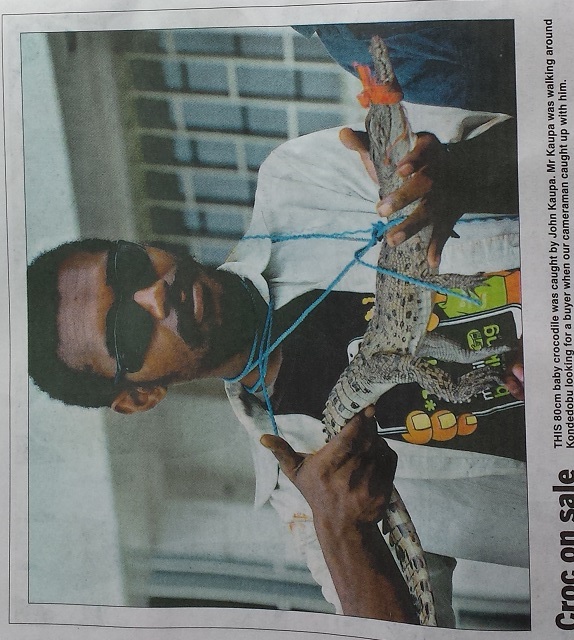 Just when I think I’m starting to understand Papua New Guinea, I am surprised by something out of left field. 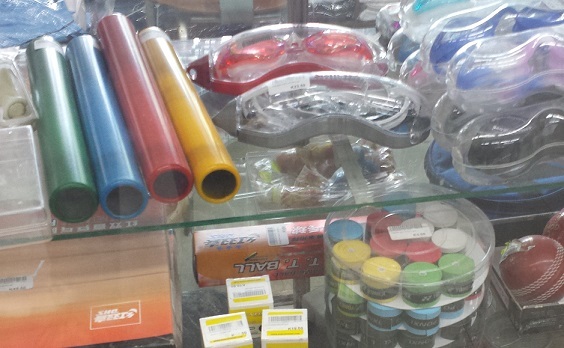 For example, I was in a sports store this week and spotted these relay batons for sale. In a country with so many problems, it seems odd to me that something so frivolous would be available. So many problems but the availability of relay batons is not one of them. The absurdity can be overwhelming at times. I tried to buy a 2014 wall planner for the office, only to open it up and find that I had accidentally bought the 2013 version. 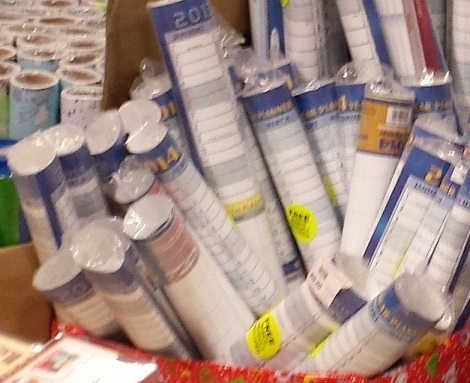 The store just threw the 2014 wall planners in the same box as the 2013 wall planners. And they charge FULL PRICE. Not even a discount for the fact that it’s JANUARY 2014! Only people with time machines need to plan 2013 now. I went back and they exchanged it for me. In fact, the 2014 version is cheaper so they refunded the difference. I spotted the truck that takes away the Pig Bins. 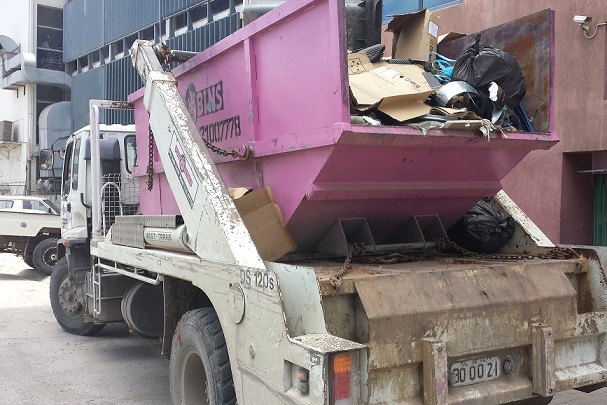 I find it interesting that someone has made the investment to bring in the big bins and the trucks. The private sector seems to be able to accomplish anything when there is money to be made. This young entrepreneur is making money by selling baby crocodiles in the street. I was tempted. I have visions of a crocodile-filled moat around my house. Maybe I could give the crocodiles special helmets with frickin’ lasers on them. 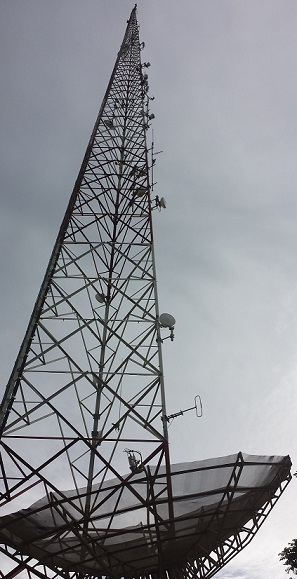 I grew tired of the outrageously unreliable internet connection that I was using from Digicel and upgraded (at vast expense) to a satellite system. It’s really expensive but I feel connected to the world again. 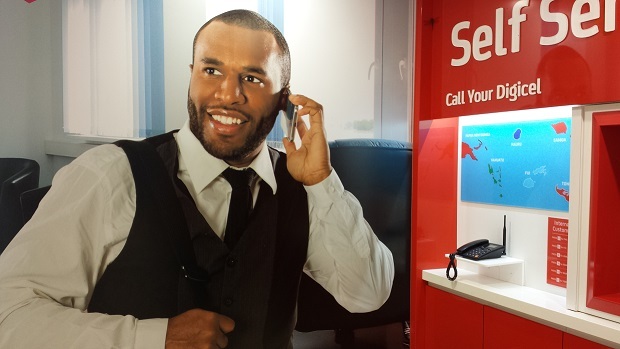 Of course if Digicel would invest as much in their network as they do on these glossy ads, I wouldn’t have had to change providers. 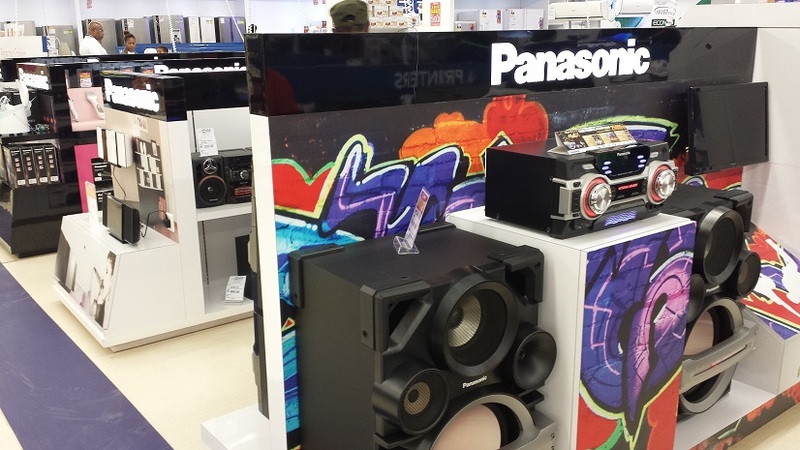 One of the local department stores went nuts in their electronics department while I was away. I came back to discover that it’s 1984 all over again in PNG. 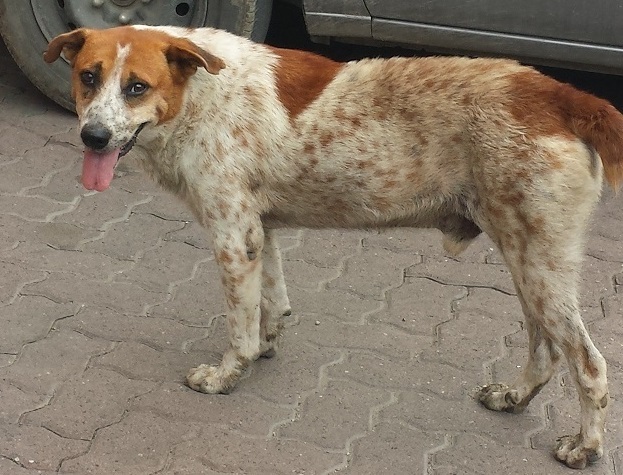 This dog likes to shelter under my car when it’s parked at the office. It’s smart enough to know that when the engine starts it’s time to move. 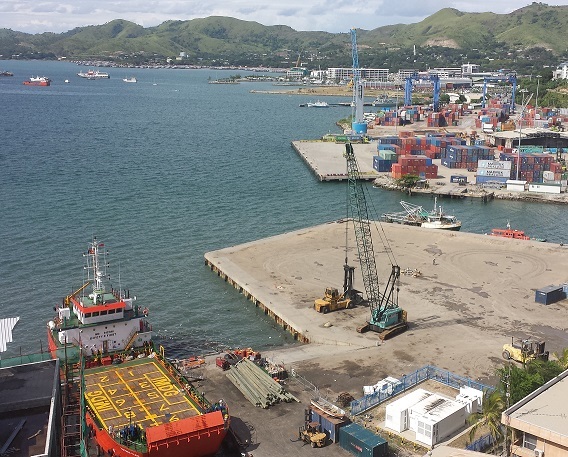 The traffic situation in Port Moresby continues to deteriorate. I was stuck in bumper-to-bumper traffic (“tailbacks” as they call it in the U.K.) for 45 minutes this week. In a city of 300,000 people, this is unheard of. It’s caused by a combination of an increased number of cars on the road, poor driving, poor road conditions, poorly designed intersections and poor traffic control. All fixable if there were the time, money and resources invested in finding solutions. I hate being stuck in traffic. Unlike other Asian countries there are almost no motorcycles here so this one caught my attention. Hopefully we’ll see more of them on the roads in time. 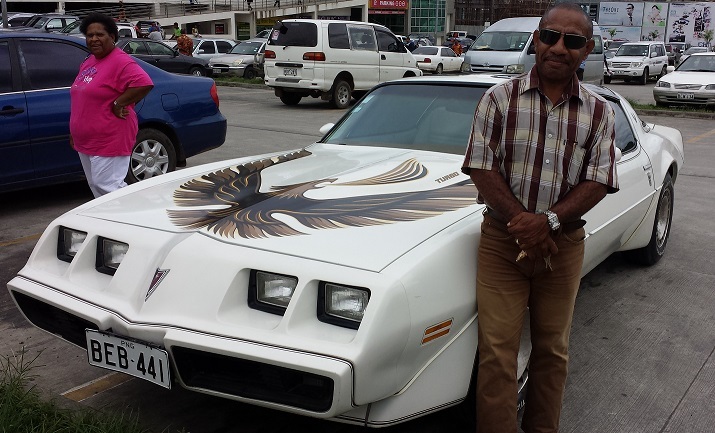 This is Simon and his 1980 Turbo Trans Am. I noticed the car in the car park at Vision City mall this week and struck up a conversation with him. 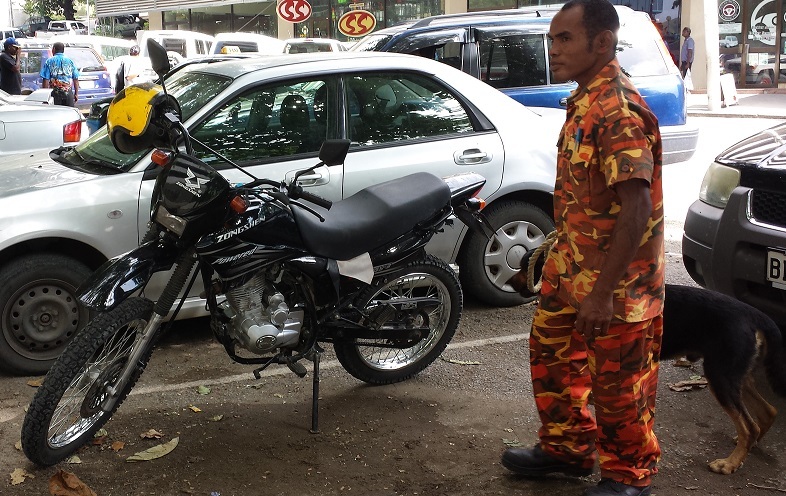 He’s a well-educated Papua New Guinean businessman and he explained that he wanted a car that stood out from the crowd. So he went to the trouble of importing it directly from the USA. Even though they drive on the left hand side of the road here, it is legal to have left hand drive cars. This place is an odd mixture of Pacific Island, European tradition and Asian capitalism. There are many Asian products for sale in the supermarkets now and they are ridiculously cheap compared to Australian products. 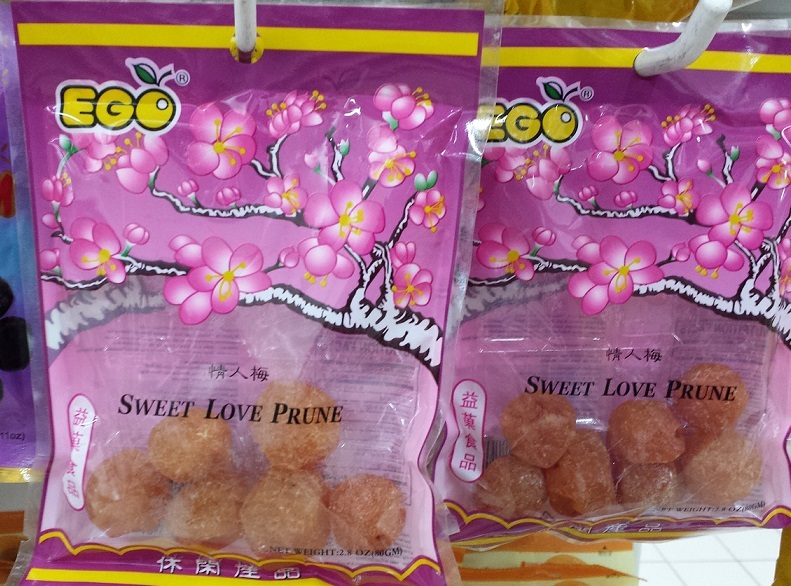 Like these “Sweet Love Prunes”. Everybody needs a little sweet love prune now and then. I celebrated my second Australia Day in PNG this week. 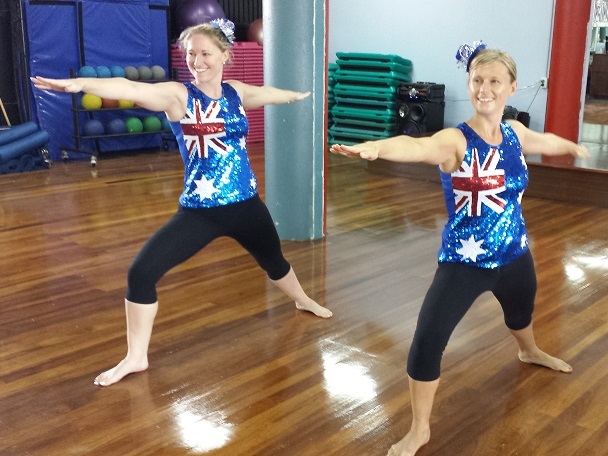 Some of the yoga practitioners at the gym were getting into the spirit of the day. The bathroom renovations at work seem to be progressing slowly. 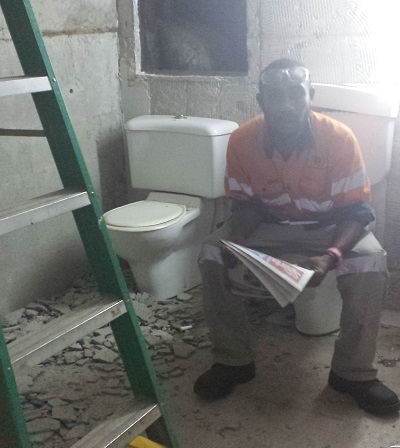 I found out why – the workers spend their days sitting on the can reading the paper. 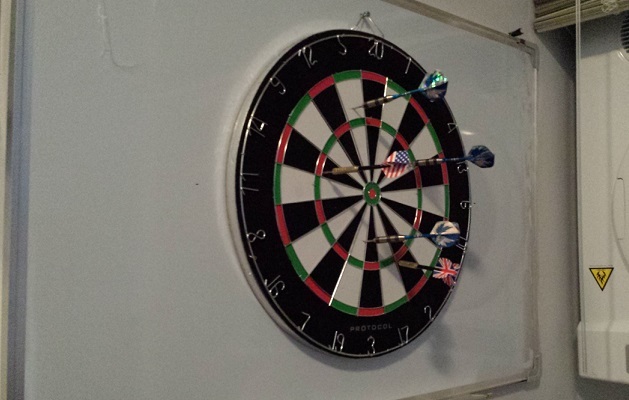 This dart board is a recent addition to the house. I put it up with a whiteboard behind it to protect he wall from poorly-aimed shots. I guess I just decided that I needed something more to offer guests to do and it seemed like a good idea to hand out sharpened metal objects to my drunken friends for them to throw around the house. I’m still making sense of Pidgin English and slowly learning a few phrases. 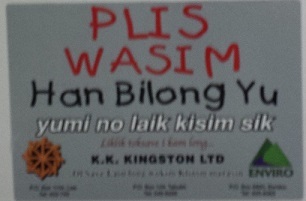 This sign says “Plis wasim han bilong yu”, which means, “Please wash your hands”. To create the concept of ownership, Pidgin uses “belong you”. In slang Pidgin, which is commonly used by young people, this is now being abbreviated to “blo yu”. She is the niece of one of the neighbourhood families who is here visiting at the moment. Mary’s left eye has a milky look to it. I asked her about it and whether she had ever had a look at it and she told me that she hadn’t. I arranged with her family to take her to see a doctor to see what they could do. 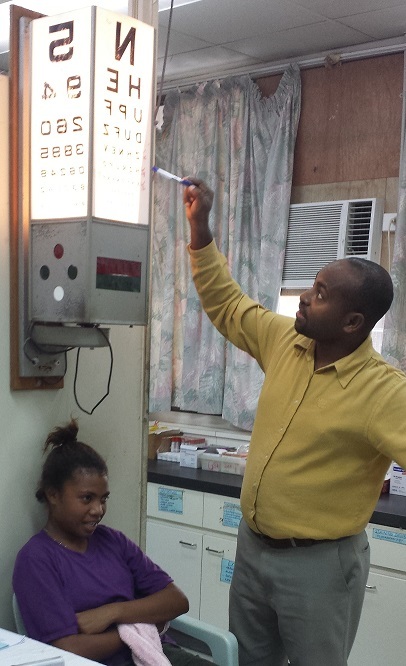 We started with a GP, who took a look and then referred us to the specialist eye clinic at the Port Moresby General Hospital (PMGH). We found the eye clinic and Mary saw the specialist. 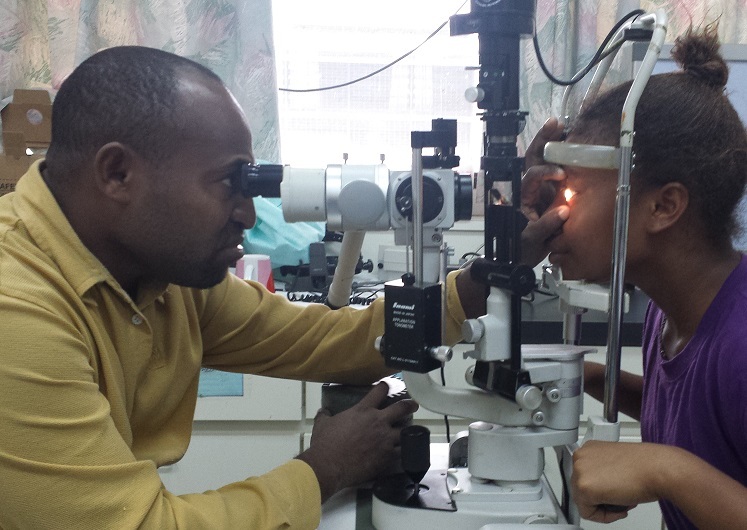 He gave her a sight test. He also covered her good eye and asked her how many fingers he was holding up. She said, “One”. He was holding up four. She has no useful sight in her left eye. I was most impressed by the professionalism of the doctor. He was very knowledgeable and had an excellent manner. He did a thorough examination and asked a series of questions to understand the patient history. It turned out that the injury occurred when Mary was just 3 years old. A cousin was playing with wire and poked her in the eye with it. 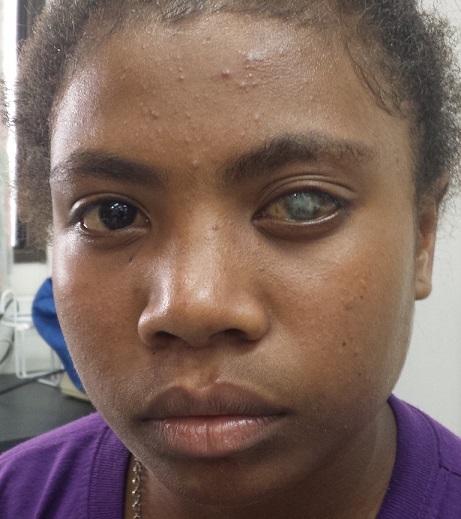 The eye was badly damaged and she has had vision problems ever since. The doctor finished his examination and gave us the verdict. 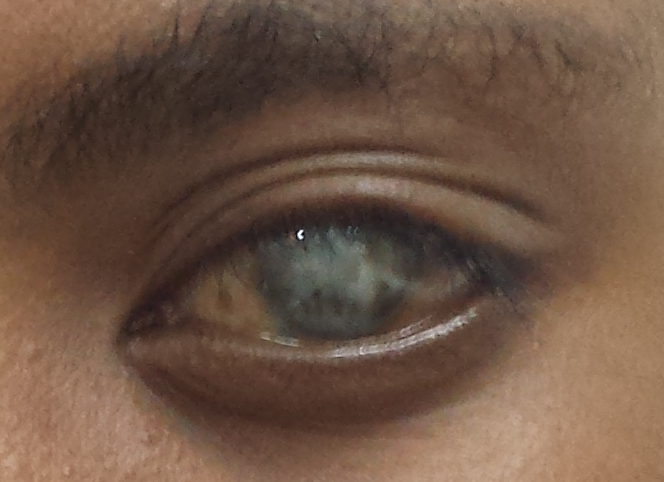 He said that her left eye has “limited acuity potential”. Essentially, the damage done was too great. There was a window in the first week or two after the injury when treatment would have been effective. 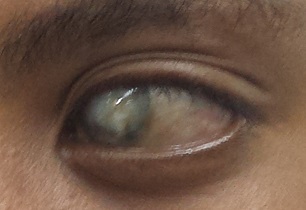 But inflammation caused serious damage to the interior of the eye as well. Apparently, it is common here for people not to seek treatment until it’s too late because they hope that things will heal on their own. The only available treatment would be a cornea transplant and because of the damage to the interior, it is unlikely to help much. 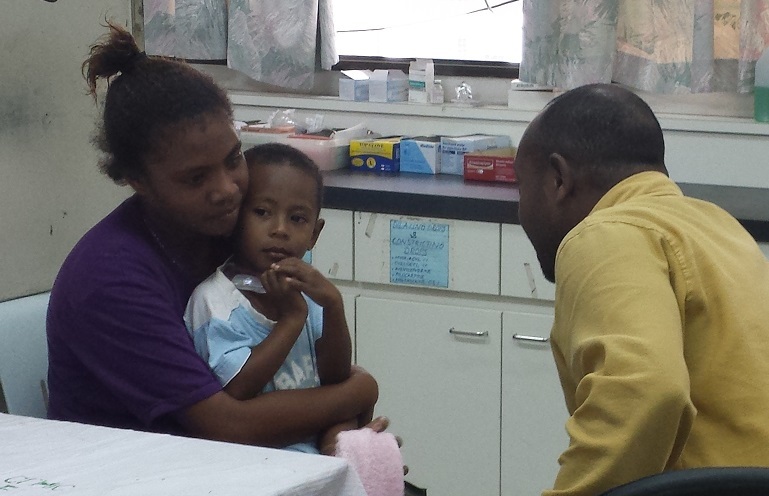 Last year there were two cornea transplants performed in PNG. 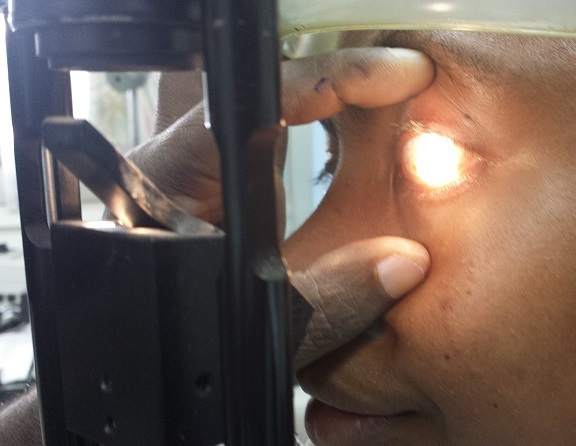 The reality is that if there were a donor cornea available it would go to a patient with better potential for improvement in sight. 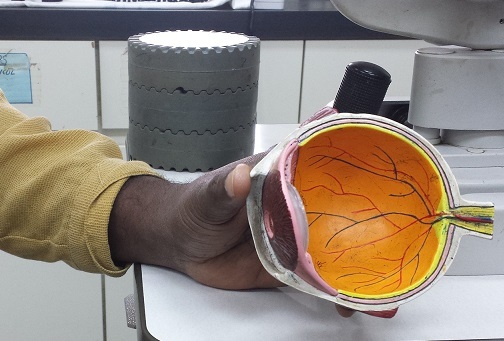 There is a treatment available in other countries that would reduce the visual impact of the injury (essentially a tattoo to change the colour of the eye), but that procedure is not possible here. I was bitterly disappointed, and while she kept a brave face on, I could see that Mary was too. I felt so angry that if Mary had been born in Canada or Australia that she would still have her vision but because she was born here, she will be blind in that eye for life. 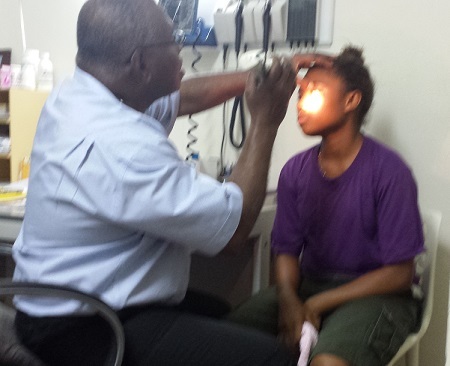 The doctor explained to her that her remaining eye is now a ‘golden eye’ – it is precious and must be protected. He said to be careful around people playing with sticks, with broom handles, etc. This is not the land of fairytale endings. It’s not a place where medical miracles occur (despite all the praying that goes on). It’s a place where neglect leads to suffering. It’s a place where inadequate education and ineffective institutions cause untold pain and hardship. Things are improving here. But the pace of improvement is jarringly slow at times.